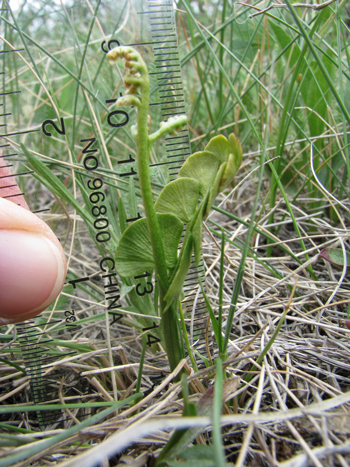 The Saskatchewan Conservation Data Centre set out to explore the diversity of Moonwort (Botrychium, sometimes also called Grape-ferns) species in the Cypress Hills during the 2015 field season. Collectively, Moonworts in Saskatchewan are rare, with many ranked as S3 or less and having a global rank of G3 or less (see our Species Conservation Rankings page for information on what the ranking means). In addition, most species have not been recorded in Saskatchewan for some time (>15 years). The Cypress Hills has records of a number of Moonwort species from the past and so made a natural place to begin a concentrated search effort to update our data. Moonworts are vascular plants that reproduce by spores and are related to ferns. Their life cycle involves both a gametophyte (which grows underground) and a sporophyte, which is the part that we see above ground. These plants also rely on a relationship with mycorrhizal fungi to survive. The name "Botrychium" refers to the grape-like clusters of sporangia that the plants produce (hence also the common name "Grape-fern"). Folklore indicates that these plants are thought to have magical powers. While the genus is readily identifiable, placement to species is found by many to be difficult since individuals within a species can be highly morphologically variable. Recent DNA research on these plants has made it much easier to determine which characteristics are most useful in identification and therefore confidently place plants to species. Taxonomic keys based on the more recent work make it much easier to determine the correct species identification. Our searches led us to collect a new Moonwort species record for Saskatchewan: Daisy-leaved Moonwort (Botrychium matricariifolium). Another species we found that is fairly new to the taxonomic world (its name has not even yet been validly published) was Michigan Moonwort (B. michiganense). This species was likely known to Moonwort experts to occur in Saskatchewan, but as it was not included in the Flora of Saskatchewan Ferns and Fern Allies of Saskatchewan (2011) we believe that it was not known to local experts to occur here. Specimens of both of these species have been deposited with the W.P. Fraser Herbarium in Saskatoon to serve as a permanent record of the finds. Other observations included Pale Moonwort (B. pallidum), Western Moonwort (B. hesperium), Upswept Moonwort (B. ascendens), and Common Moonwort (B. lunaria). These exciting finds confirm that you never know what you might find out there in this wonderfully diverse province of ours! Farrar, DR and SJ Popovich. 2012. Ophioglassaceae. Pages 24-35 and 388-91 in: Weber ,WA and RC Wittmann. Colorado flora, eastern slope: a field guide to the vascular plants. 4th edition. University Press of Colorado, Boulder. Farrar, D. 2011. Moonwort (Botrychium) Systematics. Ada Hayden Herbarium. <http://www.herbarium.iastate.edu/botrychium.html>. Accessed 16 September 2015. Harms, VL and AL Leighton. 2011. Ferns and Fern Allies of Saskatchewan. Flora of Saskatchewan Association and Nature Saskatchewan Special Publication No. 30. Regina, SK.